September 19, 2018—Cottonwood Properties, located in Black Mountain at 100 W. State Street across from the Town Square, has been collecting hurricane relief supplies since news of the storm hit. Many area businesses have already joined Cottonwood’s efforts, including the wonderful folks at Jim Cook Chevrolet who are filling up a pickup truck in their car lot right now to add to our cause at 1075 North Main Street Marion, NC 28752. 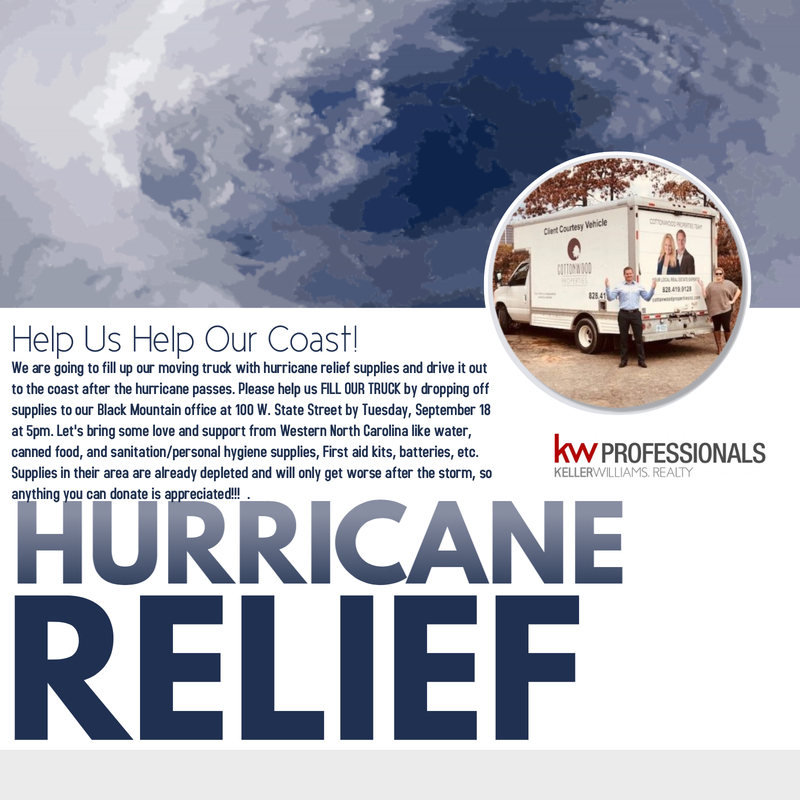 For those located in Asheville, Alex King Yarmo is collecting supplies to add to the truck at the downtown Keller Williams office located at 86 Asheland Avenue. “We’ve got a long way to go to fill this big truck, so please drop off your supplies now through Sunday,” Mr. Colley says. “We’ll be heading out early Monday morning to drive everything we collect out to Wilmington.” Folks that want to drop off supplies over the weekend are encouraged to send a Facebook message to the Cottonwood Properties’ page at https://www.facebook.com/cottonwoodpropertiesnc/ or contact Eddie Colley directly through private message at https://www.facebook.com/eddie.colley.56. Our team at Cottonwood Properties is dedicated to offering the best customer service possible, with high standards and a culture of caring. When you're looking for a Real Estate firm to help you navigate through the process of buying or selling, you need to choose a company that is experienced, local, and has a proven track record. Cottonwood Properties is a full service Real Estate firm focusing on sales and short- and long-term rentals in Asheville, Black Mountain, Montreat, and surrounding areas. We take pride in our knowledge of the Western North Carolina (WNC) region. Whether you’re looking to purchase a condo in downtown Asheville, or rent a vacation cabin getaway in the mountains, we’re here to help. For more information, call Cottonwood Properties at (828) 419-9128, visit their website at https://cottonwoodpropertiesnc.com/blog/posts/2018/09/12/help-us-help-our-coast/ or connect with Cottonwood Properties on Facebook or Instagram.